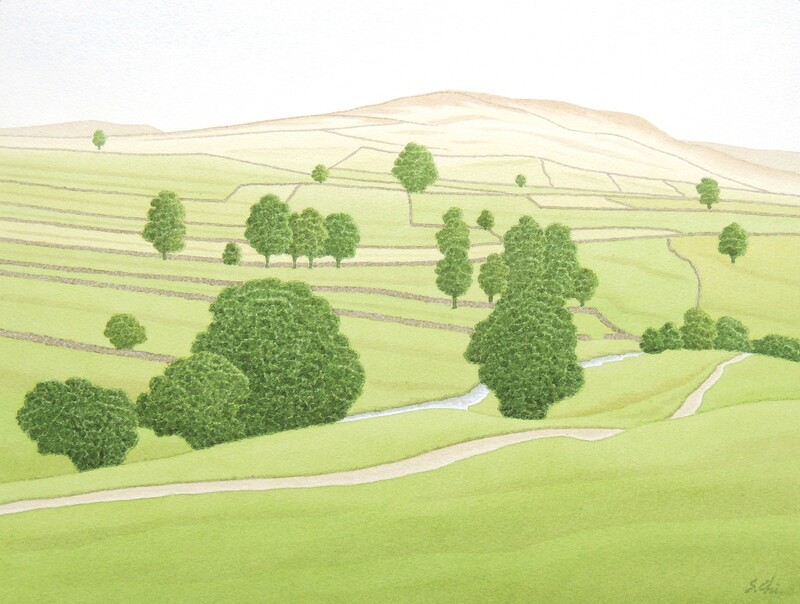 The upper Airedale beyond Skipton is also called Malhamdale. 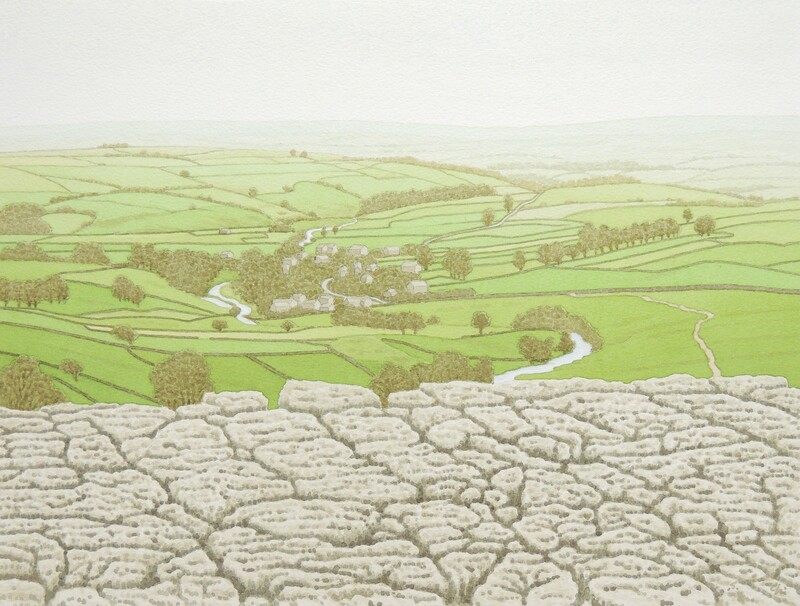 There is Malham Cove, one of the most spectacural natural features in Yorkshire, 9 miles to the northwest of Skipton. The cliff of a magnificent semi-circular outcrop of limestone is from 240 to 300 feet in height and more than 1000 feet in width. It is said that before the Ice Age there was a vast waterfall plunging here. But later the water eroded the bed of the river gradually to make the river sink into the ground. Now the tiny stream of Malham Beck, one of tributaries of the River Aire, emerges at the foot of the cove. Turner visited here in 1797 and 1809 and painted the cove in watercolours in 1809. In his picture, the left half is getting dark in a shower and a rainbow is appearing in the right. And Malham Cove is shinning whitely reflecting the sunlight behind the rainbow in the distance. In the foreground, two herd boys are garazing a flock of sheep and cattle. Turner's naturalistic but romantic characteristics are expressed clearly in this picture. When I visited here, I could see the similar landscape to the picture of Turner. There was no rainbow, only a few sheep grazing on the beck. It seemed to me as if the time had stopped since the days of Turner or I had strayed into the days of Turner. I climed the slope of the west side of the cove and stood on the top of it. What I saw there was a striking pavement , a geological masterpiece of eroded limestone. This pavement is said to be one of the finest examples in England. Approaching the rim of the cove, I could see the bottom of the cove through crevices of the pavement. If I had been driven by a strong wind, I would have fallen nead over heels into the former basin of a waterfall. But the view of Malhamdale to the south from the pavement was very splendid. The dale was coverd with green grass even though it was late December when I visited there. Sheep were here and there. Going upstream the ancient river bed about a mile takes us Malham Tarn, a small lake, the source of Malham Beck. There is a hunting lodge where we can take refreshments. Then, I walked along the river bed to seee the lake. Soon after walking , it looked like rain suddenly and the cold wind blew on my face from the north squarely. It started to sleet when I came to the place where I could see the lake. The sleet hit my face without mercy. The landscape of eroded limestone surrounding me was very bleak like a world of death. No one was walking except me. The dark clouds lay low and the visibility became bad because of the rain and sleet. Worrying about the way to return, I decided to give up going to the hunting lodge. 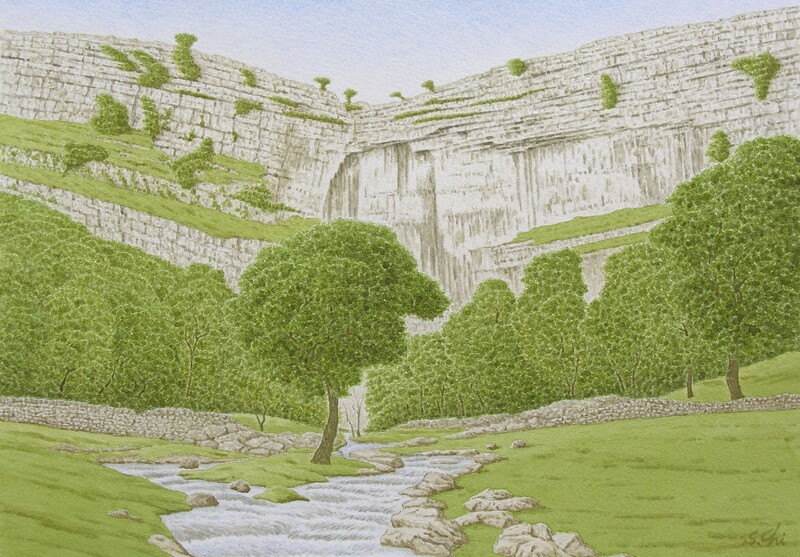 When I returned to the foot of Malham Cove, the rain and sleet stopped completely and the sun began to shine. No rainbow formed in the sky, but I felt that I walked in the Turner's picture.